The new report by Zion Market Research on the “Global Floating Docks and Drive-On Boat Lifts Market — Global Industry Analysis, Size, Share, Growth, Trends, and Forecast 2016 – 2024" has a vast information about the market and its potential. 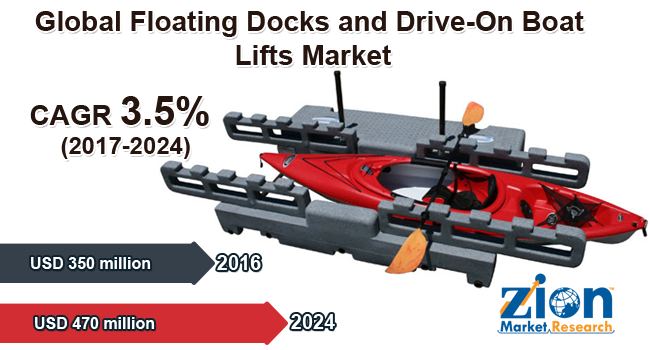 The global floating docks and drive-on boat lifts market was valued at around USD 350 million in the year 2016 and it is expected to reach approximately USD 470 million by 2024. The global floating docks and drive-on boat lifts market is expected to exhibit a CAGR of more than 3.5% between 2017 and 2024. Ease of accessibility and safety provided by floating docks will majorly drive the floating docks and drive-on boat lifts market. The floating docks are used to ensure that the boat is stable; it also allows in performing minor repairs or other work which is needed. Floating docks adjusts automatically to the high and low water conditions, therefore, are considered as the best solution for keeping the boat dry and safe when it is not in use. Whereas, heavy loading and unloading pose a major challenge to the use of the floating docks during the forecast period. Our research analysts observed that factors such as high safety of floating docks in rough weather, easy access, and storage of boat will positively affect the growth of the floating docks and drive-on boat lifts market over the forecast period. The global floating docks and drive-on boat lifts market is segmented on the basis of the type, applications, and the geographical regions. Floating dock is a structure that can be submerged to permit the entry and docking of a ship and is also used for lifting the ship from the water for repairs, or alternatively, it can be referred as a submersible floating structure that can raise a vessel out of the water and serve as a dry dock. Docks are considered to be the best option to improve the functionality of an adjacent shoreline. There are various types of dock systems available in the market such as heavy duty, lightweight, and others, which is based on their utilization in the residential or commercial applications. The market for floating docks and drive-on boat lifts is segmented by different types and applications. High durability and corrosion resistant properties of metal floating docks keep them dominant over the other types of floating docks and drive-on boat lifts market. In metal floating docks, the aluminum docks are most popular in use, owing to its lightweight and high resistance features. Unlike other metals such as steel, it is heavy and much more susceptible to corrosion. The plastic floating dock holds the second largest market share in global floating docks and drive-on boat lifts market. Plastic floating docks are considered to be safe and provide easy drive-on mounting and dismounting, as they are made with molecular weight, high-density polyethylene, and with less gaps in docking systems making dock blocks safer and minimizes the possible injury. The plastic floating dock segment is expected to grow with the highest CAGR of 4.3% during the forecast period. Based on applications, the global floating docks market is dominated by the commercial segment. Commercially docks are important in waterfront businesses, as it offers long-term property value for the owners and provides convenience for customers. Floating docks are a budget-friendly and highly economical alternative for the dock owners who seek convenience. They provide convenience, especially in areas where the water level fluctuates. Modular composite docks have made installation and customization easy thus boosting the growth of the market during the forecast period. The floating docks and drive-on boat lifts market is growing at a rapid rate in the developed regions. North America dominates the floating docks and drive-on boat lifts market owing to the growing waterfront businesses in the region. Whereas the Asia Pacific is having a significant share in the floating docks and drive-on boat lifts market and is anticipated to grow at highest CAGR during the forecast period owing to the increasing waterfront campgrounds, and government agencies, such as the parks department thus positively contributing to the growth of the floating docks and drive-on boat lifts market in the Asia Pacific. The major market players in the floating docks and drive-on boat lifts market are AccuDock, Basta Boatlifts, Bellingham Marine, Candock, Carolina Waterworks, Inc. (Safe Haven), Cubisystem, Dock Blocks, EZ Dock, Flotation Systems Inc., HydroHoist Marine Group, Ingemar, JetDock Systems, Inc., Jetfloat, MariCorp, Marine IP Ltd. (VersaDock), Marinetek, Martini Alfredo, Meeco Sullivan, PMS Dockmarine, Pontech, SF Marina Systems, Shenzhen Blue Ocean Engineering Co., Ltd., Sunstream Boat Lifts, Technomarine, Wahoo Docks, and Walcon Marine Ltd., among others.